The ConveyorControl Configurator is a PC software programme for the configuration and simple addressing of the ConveyorControl system. A planned handling facility can be visualised with the help of this programme and then the parameters set. If the parameters are to be transferred to the corresponding modules or the modules addressed, then the PC must be connected via a USB cable with a CentralControl or GatewayControl of the ConveyorControl system. Please fill in the form below in order to download the Interroll ConveyorControl Configurator. Thank you. Please also read the operating manual of the product, which you can download here. The software ConveyorControl Configurator is intended for the use in conjunction with the operating system Microsoft Windows 7 and Microsoft Windows 8.1. Compliance with the system requirements must be ensured by the operator during the entire service life. Changes to the software, including reverse engineering, are prohibited. 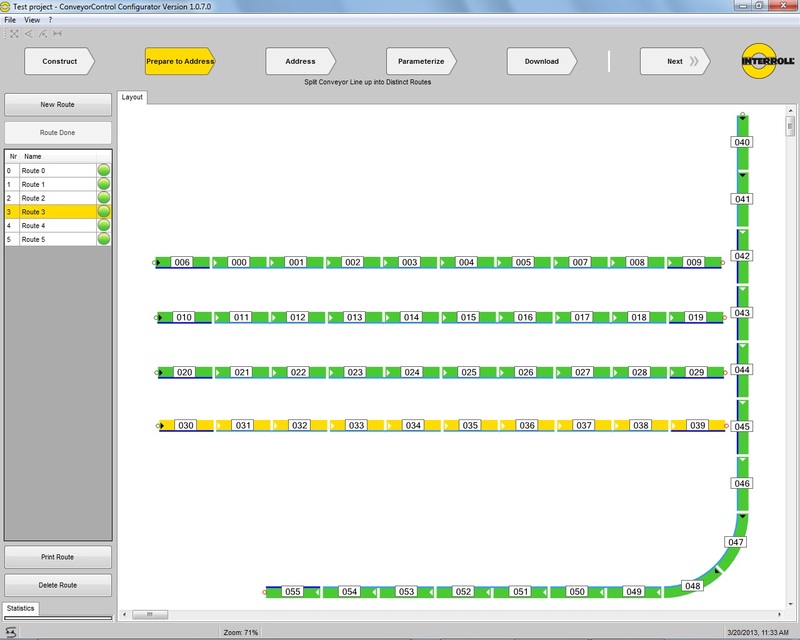 The software programme is designed to be used in conjunction with modules of the Interroll ConveyorControl system. It may only be used in industrial applications. The software does not implement any safety functions related to the operation of a handling system from the point of view of either personal protection, protection of the system or the goods to be conveyed. The user must independently ensure that dangerous operating conditions are excluded in each case. Liability for damages caused to the user or a third party by the installation and use of the software programme is excluded. Full administrator rights are a prerequisite for successful installation on the installation system. The setup.exe file should be accessed in the unzipped main directory to start the installation. The installation process is dialogue-driven. The software can be installed on one or more PCs any number of times. Use of the MS-Windows-based function "remove software" in the Control Panel is recommended to desinstall the programme files. The deletion of application files/project files is not effected automatically with the desinstallation. These files must be individually deleted by the user in each associated directory.